The US and Australia were the only two countries that voted against the resolution. The UN Human Rights Council in Geneva voted Friday to establish a Commission of Inquiry to examine possible war crimes committed by Israel during the recent confrontations on the Gaza border. The resolution was approved by a vote of 29-2, with 14 abstentions, following a day-long special session in Geneva. The US and Australia were the only two countries that voted against the resolution. Germany, Hungary, Japan, the Republic of Korea, Croatia, Ethiopia, Georgia, Kenya, Panama, Rwanda, Switzerland, Togo, and Britain abstained. The Ukraine and Mongolia were not present at the time of voting. Britain on Friday stated that it recognizes the "tragic and concerning loss of life" in recent Israeli-Arab violence on the Gaza border. However, it said it was could not support an investigation that ignored Hamas's role in what happened, since it would not "provide us with true understanding of accountability." 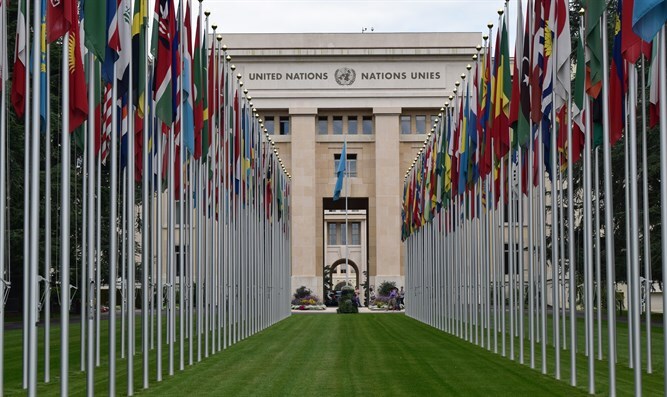 Germany said during the UNHRC session that Israel must refrain from excessive use of force against unarmed civilians, Likewise, Hamas and the leaders of the "protest" must ensure that it remains non-violent, said Germany, which noted that regrettably, the text of the resolution does not adequately reflect the situation on the ground. The "Palestinian" Ambassador to the UNHRC called peaceful demonstration an "absolute right" on Friday. "Israel and its defenders have given the impression that Palestine occupies Israel. How long will this joke continue?" he asked. The US representative to the UNHRC stated that Washington would vote "no" on the resolution and called on other member states to do the same. Israeli Ambassador Shechter called the resolution "devoid of any sense" and said it "deserves to be torn apart." The US said that the resolution's one sided focus, and its failure to hold Hamas to task, evinces bias and calls into question the UNHRC's credibility.